We’ve all done it. Declared a new path forward (“No more facebook, I am going to read a book instead!”) only to find ourselves, hours later, back in the habit. Scrolling, barely present, and regretting it later. It’s not your fault. There are literally millions of dollars being poured into making smartphone apps, television shows, and sugary/salty foods addictive. It’s big business. Manipulating human habits is an enormous business. We are a small business. We want to make space for people to connect with their bodies, examine the habits of their mind and movement, and learn to care for themselves in our overly busy world. The other day, someone told me to relax. You can imagine how that went. I didn’t lash out at them, but I did feel hurt. I wasn’t trying to be dramatic, but I had real feelings about the situation. And being told to relax was a quick dismissal of my feelings, rather than an acknowledgement of them. I have this same thought about the phrase “Love your body,” which is a phrase I don’t really use, especially not when I am teaching yoga. I don’t think it’s bad, I just think it’s on the same end of the spectrum as “relax.” It is an instruction that, while well-intentioned, might miss the point. Telling someone (even yourself) to “love your body” may not acknowledge the real and complex experience that you have with your body. That it might be hard to love your body when you feel that the world has been telling you it’s ugly, dysfunctional, or bad your whole life. It might be hard to love your body if your body is the site of trauma. It might be hard to love your body if your body is in pain a lot of the time, or experiences anxiety or depression. What I wish my friend had asked me (instead of telling me to relax) was simply “What’s going on?” Taking a moment to acknowledge my feelings might have made a huge difference in how I was able to be present. 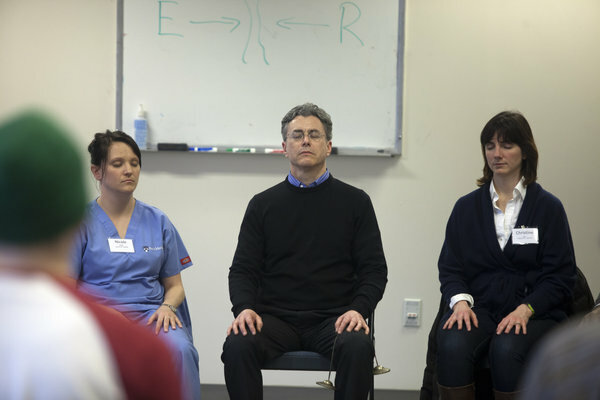 Michael Baime, director of the Penn Program for Mindfulness teaches a class in mindfulness and meditation.